The CSSD working group Bandung Humanisms hosted the conference “China and Africa at a Crossroads: Revisiting the Legacy of Bandung Humanisms.” The event opened with Project Director Stathis Gourgouris placing humanism at the center of the “Bandung spirit” associated with non-alignment and anti-colonial thinkers like Frantz Fanon and W.E.B. du Bois. The first panel called attention to mid-20th century China-Africa interactions that fell from view, at least in US academic discourse, under the rubble of the Berlin Wall. Mahmood Mamdani moderated this panel, with Howard French served as discussant for Jamie Monson (“Decolonizing Translation: Gender, Intermediaries and Interpretation in China-Africa Engagement”) and Duncan Yoon (““Africa, China and Cold War Literature”). Jamie Monson emphasized the importance of gender in the interlingual encounters of the China-Africa entanglement. Her presentation illuminated the normally obscure role of Chinese and African women internationalists, whose knowledge production has not only been undervalued but was also discarded as a consequence of the global neoliberal turn. Glimpses of her archive—including as-yet unpublished photographs and interviews with African and Chinese women who were diplomats, translators, and teachers—were audibly appreciated among the audience. The second half of the workshop centered on how concepts of race and place shape the encounter between Africa and China. Lydia H. Liu acted as moderator and Stephanie Rupp as discussant for a panel with Rebecca Karl (“China and Africa: A Longer View from the Turn of the Twentieth Century”), Yan Hairong (“Chinese, Africans, ‘Laziness’ and Discourse of Racialization”) and Barry Sautman (“Differences at the Margin: Understanding the Chinese Presence in Africa”). The latter two papers were co-authored by both Yan Hairong and Barry Sautman. Through texts spanning the 19th-20th centuries, Rebecca Karl explored what is effectively the reverse of Ngūgī’s gaze towards Maoism: the process whereby “Africa” came into focus in Chinese thought. Karl’s analysis traced China’s evolving concepts of the Dark Continent over the long durée of globalizing capital to show a picture of “Africa” inflected, though not determined, by the geographic and racial signifiers set into motion by global European empires. Like Karl, Yan Hairong raised the question of the influence exerted by European colonialism, particularly the biological-essentialist notion of race. To do this, her talk offered a discourse analysis of the prevalent stereotype of locals as “lazy” among Chinese émigrés in sub-Saharan Africa. Yan Hairong argued that Chinese concepts of “laziness” differ across linguistic and historic situations with the result that, in some instances, they should not be understood as identical to stereotypes derived from European, colonial racial discourse. The final presentation of the day by Barry Sautman widened the gaze to the bi-continental theme in itself, casting a skeptical gaze on Western media representations of China in Africa. Sautman argued that these international portrayals exaggerate China’s role compared to Africa’s other “traditional investors” and cast China’s African ventures in an unfavorable light. Among its motives, the call for scholarly reorientation towards south-south encounters invokes the asymmetries shared by direct investment in Africa and 20th-21st century international co-operation, and the workshop raised many compelling questions well beyond the scope of a single workshop. The second panel was particularly animated by underlying epistemological questions about the unevenness of China-Africa encounters, and unsurprisingly, the presentations provoked a heated discussion. At minimum, this welcome contention over either contemporary internationalism or the intellectual, interlingual questions prompted by mid-20th century Afro-Asianism, further corrects what Yoon named as the US-Soviet bias in Cold War cultural studies. It’s promising that between them, the two panels underlined the importance of revisiting Bandung by highlighting the analytical and ethical problems in the encounters of sub-Saharan Africa with China. Firstly, by addressing the compelling need to rethink comparative literature in terms of trans-regional, intercontinental intellectual histories beyond Europe and North America, Yoon realigned a classic exemple of postcolonial writing, and Karl plotted Chinese thought intersecting in a circular manner not unlike maritime flows of commodities with European colonialism. 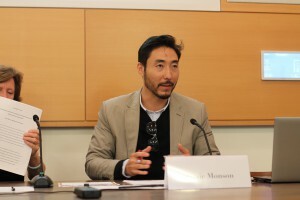 Likewise, Monson’s focus on the concerted effort during the last century to translate directly between Chinese and Kiswahili lent a salutary attention to discourses beyond our Anglophone medium for scholarship, an effort that was complimented by the research Karl and Yan Hairong presented.